This QE is Marr's fourth, and it is easily his best. Which surprises me, Marr not being a Catholic or believer, etc. But that's probably why he's been able to assess Pell clearly and objectively, just based on the extensive research he's obviously done. 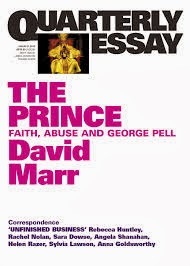 He focuses on Pell's handling of the sexual abuse crisis in the church over decades, and very effectively brings all the threads together to produce a damning indictment. Believe me, this QE will make you angry! Beautifully written and well worth reading.